1. Collect the emerged adult flies, both mwh +/+ flr3 and mwh +/TM3, BdS genotypes, from both the ST, and HB crosses and store in 70% ethanol. 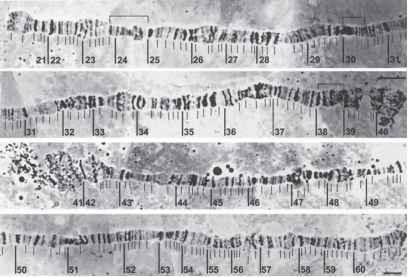 TM3 heterozygotes are identified by the BdS serration on the wing extremity. 2. Rinse the flies in water and then transfer them into a drop of Faure's solution on a slide. 3. Detach the wings from the body. 4. 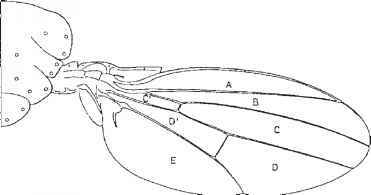 With tweezers, line up on a clean slide 10 female and 10 male wings per slide, ensuring that they are spread out. 5. Keep the wings in a dust-free environment (e.g., in a Petri dish) for at least 24 h, or for 1 h on a hot plate (60°C), because they need to be firmly glued to the slide. 6. Put a droplet of Faure's solution on a cover slip, and with the drop hanging, lower it on top of the wings. 7. Place several metal cubes on top of the cover slip for at least 24 h at room temperature, or for 1 h on a hot plate (60°C), while the preparation dries and hardens. 8. Seal the cover slip with nail polish to obtain a permanent preparation. Fig 1. Wing areas, A-E, inspected for spots.